Learn how your gift supports innovative teaching and cutting-edge research at SEAS. While solar cells generate just 1 percent of the world’s electricity today, the International Energy Agency estimates that photovoltaic use will grow by 33 percent annually and, by 2050, solar energy could meet 16 percent of global electricity demand. An international summer program at the Harvard John A. Paulson School of Engineering and Applied Sciences (SEAS) shed light on two major challenges that could impede that goal—implementing renewable energy solutions on the world stage and improving solar cell efficiency. The Green Energy Materials Summer Research Program brought together 15 undergraduates -- five each from Harvard, Ulsan National Institute of Science and Technology (UNIST) in Korea, and Jiao Tong University in China -- for a thorough study of solar energy, including a hands-on component in which student teams designed, fabricated, and tested photovoltaic cells. Faculty from SEAS and both Asian institutions led discussions on light and photon physics, the history of solar cells, and the chemical reactions that enable devices to function efficiently. Student teams then worked together at the Center for Nanoscale Systems (CNS), using intricate nanofabrication techniques to engineer photovoltaic cells. Working at CNS was a lesson in patience for Pesek, who enjoyed the opportunity to see what research in a lab is really like. For intended environmental science and engineering concentrator Daniel Chang, A.B. ’20, the two-week program opened his eyes to the array of resources at Harvard. Chang walks by the CNS each day, but never knew nanoscale research was happening under his feet. He was fascinated by the delicate techniques involved in designing silicon sheets that were a fraction of the width of a human hair. The maximum efficiency of a silicon panel is currently about 20 percent, and solar cells have advanced to the point that they routinely approach that peak, he explained. Further improving solar cell efficiency is a chief concern of engineers around the world, since intensifying problems resulting from climate change are threatening the way of life in all nations, said Seunghoon Kim, an engineering student at UNIST. 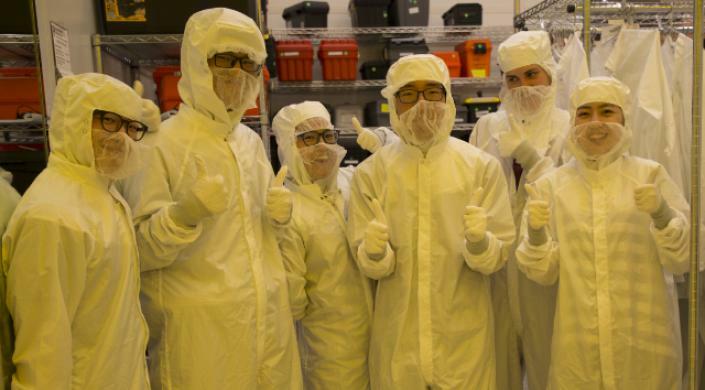 Kim, who plans a career in the semiconductor industry, hopes to apply skills he learned this summer to far-reaching renewable energy research and development projects. Fostering a collaborative mindset and helping students develop a global perspective are among the goals of the program, now in its second year, said Fawwaz Habbal, Executive Dean for Education and Research. Students learn to tackle complex challenges using a systems thinking approach and see how they are better suited to solve seemingly intractable problems when they embrace cultural differences and work together, he said.